Female Vocals, Guitar, Keyboards, Bass, Drums and sound technician. To provide your favourite tunes before, in between and after the live band sets until curfew. Your guests will be able to make requests to their hearts content! If you'd like the band to stay later until 1am. If you want to hear more from the band then this is the perfect add on for some more live music. If you'd like some chilled out acoustic music for your reception drinks or whilst you're having dinner. 2 x 30/40 minute sets from the duo is perfect! Acoustic Duo option for day time. 1 x 60 or 2 x 40 minute sets. Additional travel costs may be applicable depending on location. In addition to an evening band booking the band offer dinner sets. Either 1 x 60 or 2 x 40 minute sets. 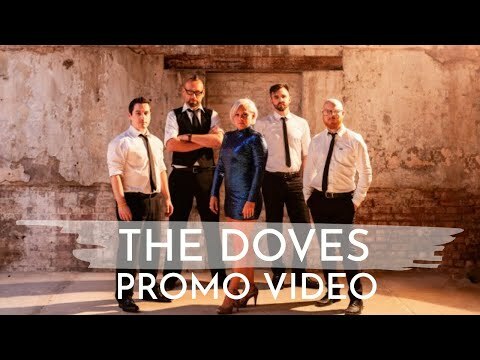 The Doves are a dynamic 5 piece function band based in Cambridge. The band features energetic female lead vocals and a mix of songs that always get audiences dancing. The Doves is fronted by talented and highly experienced female singer, Natalie. She has performed all over the UK and Europe and knows how to connect with an audience and get them all on their feet! The band members are all full time professional musicians who have toured with major acts. So you can expect a flawless performance everytime and a tight sound that will give class to your event. The key to getting an audience dancing at a wedding or party is having songs to suit everyone. The Doves have a wide selection ranging from classic pop tunes from the 70s, 80s and 90s through to the latest pop hits. The band are based near Cambridge in the East Midlands and are therefore superbly located for events across the UK. First Dance Songs – happy to learn new ones. Wow wow wow! The Doves... what can I say... no matter what your event they will keep the party going all night long. Great musicians and Nat really makes everyone love the night... no matter if dancing is your thing you won’t be able to help yourself from getting your groove on! Right from enquiry to packing down after the event helpful, professional and great people! 5* recommended. Amazing band. Very professional and always very helpful with queries and questions I had. Lovely people to meet and very very talented! Would definitely recommend them for any event! 5 Piece Band (default): Female Vocals, Guitar, Keyboards, Bass, Drums and sound technician. Technical Requirement: 2 x 13 amp sockets to artist location. Fee includes dedicated sound technician.